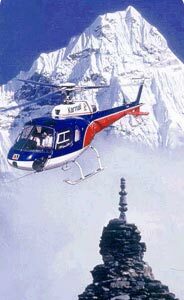 In Nepal, going to remote corners of the Himalaya by helicopter is a pleasurable and exciting activity. There are three types of helicopters currently operating in the private sector. The most frequently seen is the powerful Russian-made MI-17. This is a big bird, capable of transporting four tons of cargo and can reach altitudes well in excess of 5,000 m.
The other craft are the smaller and more maneuverable French-made Ecureuil AS350B series and the Kawasaki BK 117. They are smooth and quiet and offer excellent visibility. The Himalayan range in the north has more than 100 peaks that are over 6000 meters, of which 8 summits are among the world's tallest, and of course, the one and only Mt. Everest is not to be missed. The fertile land in the south known as 'Terai' boasts of abundant wildlife. To add more to your itinerary, you have the Kathmandu Valley with its ancient cities, temples and monasteries, and the Pokhara Valley with its beautiful lake side town nestled in the lap of the Himalayas. Visit to all these areas can be managed within a couple of days with out any obstacles. 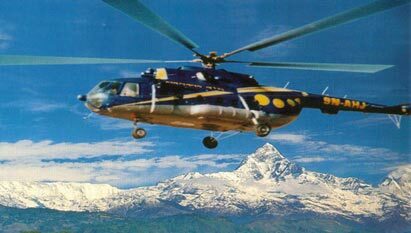 Here we would like to offer some of wonderful helicopter tour to the Himalayan Kingdom of Nepal.